Although strikes and other labour-related actions often get negative coverage in the media, occasionally there are light-hearted parts to these events. 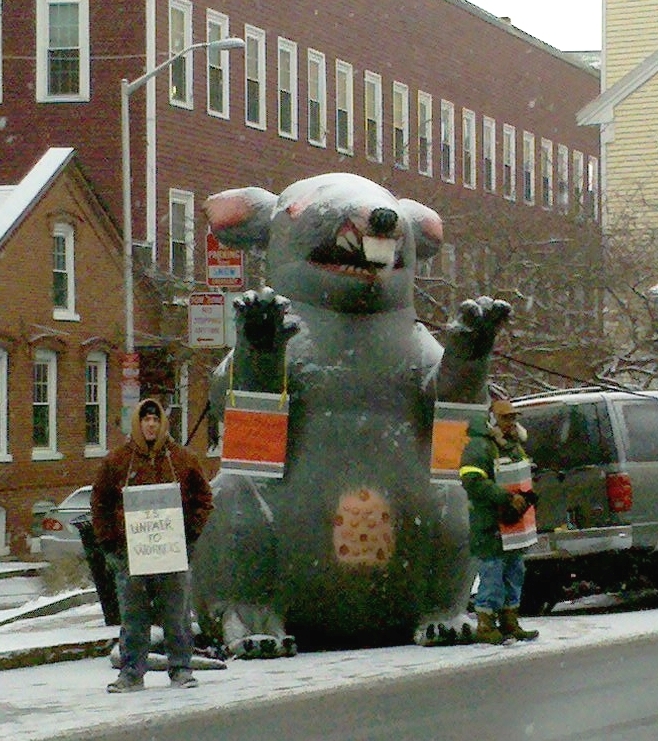 And one of these is Scabby the Rat, the giant inflatable rat that shows up in front of American workplaces where union members are on strike or locked out. This week, the VICE website posted a wonderfully entertaining and informative article about Scabby, prompted by a suggestion by one US union leader that Scabby no longer reflected unionism’s new “value proposition”. As a fan of Scabby, I was delighted to see that this opinion was promptly contradicted by numerous members of the US labour movement. Like me, they think that Scabby is important because he brings attention to strikes and other labour disputes. As a visual representation of unfair employers, he makes people think about unions’ struggles to get fair treatment for their members. I didn’t know until I read the VICE article that Scabby has been mentioned in 41 cases at the US National Labor Relations Board, along with also having been mentioned in 20 US federal court cases. The rulings in these cases have found Scabby’s participation in disputes to be legitimate, recognizing him as a form of “symbolic speech”. (Here’s a blog post outlining some of the legal decisions involving Scabby.) I also didn’t know that Scabby has a Twitter account. And it appears that Scabby also has his own Facebook page. I couldn’t find any mention online of Scabby ever making an appearance in Canada, although we certainly have more than enough labour disputes that he could show up at. (If anyone knows of any Scabby sightings north of the border, drop me a note.) But nevertheless, Scabby seems well-loved by union members in the US, and it’s heartening to see that his contributions to the US labour movement are being recognized. I encourage you to check out the VICE magazine article to learn more about Scabby. Great blog. I will have to learn more about Scabby!